March 18 through April 17, 2016. 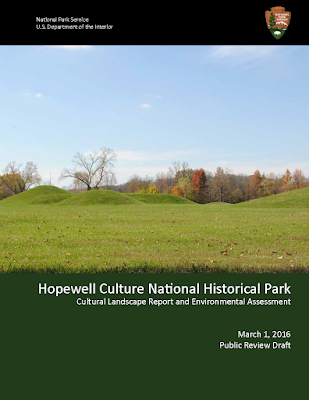 "The National Park Service (NPS) is seeking public input on a Cultural Landscape Report and Environmental Assessment (CLR/EA) for Hopewell Culture National Historical Park. The purpose of the CLR/EA is to develop a sustainable landscape management plan to protect the park's mounds, earthworks, and other archeological resources, while providing for improved visitor understanding and enjoyment. The public is encouraged to download and comment on the document during the public review period. The review period is open from March 18 through April 17, 2016. This cultural landscape planning effort has been underway since February 2015, and has included consultation with the Ohio State Historic Preservation Office and nine American Indian tribes with historic ties to the area. Cultural landscapes are settings people have created in the natural world. Cultural landscapes are intertwined patterns of things both natural and constructed: plants and fences, watercourses and buildings. At Hopewell Culture National Historical Park, the cultural landscape includes the monumental geometric earthworks and mounds built by the American Indian Hopewell culture between about 1600 and 2000 years ago, along with the topography, views, vegetation, and other aspects of their natural setting. The Cultural Landscape Report serves several important purposes. First, it serves as baseline documentation of the park's cultural landscape. The report describes the origins and history of the archaeological landscape over time; identifies the features that contribute to its historic character; and analyzes its current condition. Second, the report presents a range of treatment alternatives to provide for long-term resource protection, sustainable maintenance, and improved visitor understanding and enjoyment. The EA evaluates the environmental impacts of each alternative. The National Park Service has identified "Action Alternative 2 - Conserving and Revealing Earthwork Complexes" as the proposed action that best meets the project's purpose and need. The preferred alternative would apply preservation and rehabilitation treatments to provide visitor experiences and management tailored to the individual character of each park unit. Vegetation management would be used to prevent erosion and preserve the archaeological landscape, and to preserve and expand native vegetation and wildlife habitat. Vegetation and markings would be used to make archaeological features and spaces more visible. Utilities, structures, and other modern intrusions would be removed or relocated."